← Vegans Say What? Do you kill mosquitoes? Years ago, my father in law worked for The Enchantment Resort in Sedona, Arizona, easily one of my favorite places to visit in the United States. I am usually not a fan of Arizona, the desert or the heat but Sedona has a spiritual, mystical aspect that is difficult to understand until you experience it. No, my father in law no longer works there (he retired awhile back) nor am I being paid to be a spokes person, I just really love it and tell all my friends that it is one of those places that everyone should visit at least once. So you ask, “What does this have to do with food or veganism?” Well, back in the days that we went there we were still vegetarian and one of the things that we would look forward to the most was breakfast. No it wasn’t the omelet’s or the amazing french toast that kept bringing us back, it was actually the most simplistic option on the menu: Seasonal Berries with Heavy Cream and Brown Sugar. Big deal, right? Well actually as simple as it sounds we could never mimic the cream at home. Their cream was something special and though we haven’t touch real cream in a long time it is something we still crave. It is finally summer here in the Pacific Northwest which means we have been eating a lot of raw veggies and lighter meals. Despite being a native Southern California girl, I now find 75 degrees hot and the idea of cooking has not been very inviting. The other night we had blueberries and strawberries that needed to be used. Hubby and I were reminiscing about our enchanted berries and cream which suddenly inspired me to recreate this old favorite. The results came out great and even though this is super simple I had to share. The only thing it was missing were raspberries and blackberries but it still worked and don’t fear, you may use whatever berries you have on hand! On a side note: There are vegan white chocolate chips on top because the little vegan is often skeptical trying new things, even desserts but I knew she would try it with the chips on there. They are not needed and she ate the left overs without requesting the addition of the chips. Melt butter in a sauce pan over med/low heat. Stir in sugar, cinnamon and maple syrup and cook until sugar is dissolved. Reduce heat to low and stir in cashew cream. Once mixed completely remove from heat. Serve warm or let cool and serve cold. 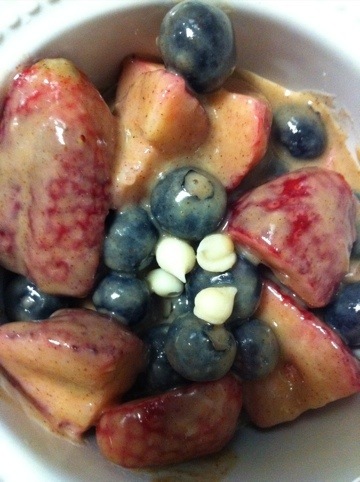 I put all my berries in a big bowl and mixed the sauce in while warm and served. You will get 6 small servings. You could also put berries in serving dishes and pour sauce over the top. It was a refreshing dessert once chilled. I also think it would be great over French Toast! Gallery | This entry was posted in Anzia's picks-a young vegans perspective, breakfast, dessert, Gluten Free. Bookmark the permalink.